Often referred to as the leading group in American drum and bass, Evol Intent released it's landmark LP "Era Of Diversion" to critical acclaim in the Spring of 2008, which explored more diverse musical styles as well as the usual DNB dancefloor smashers. 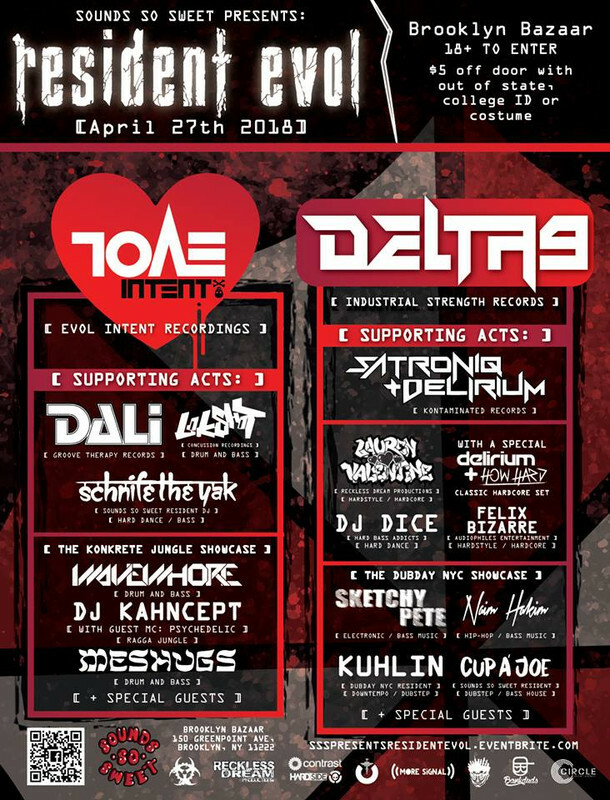 The various members of Evol Intent also have other projects much of the music community should be used to: from Knick's bass music madness as "Bro Safari" to the Enemy's electrofunk alter ego "Treasure Fingers" to Gigantor's electro-fied waveform warping as "Computer Club"
Dali has been apart of underground culture for over two decades. Starting with promoting for legendary NYC clubs like The Limelight and Tunnel he quickly secured a spot in NYC history as a promoter turned DJ in the late 90s. After the millennium Dali hosted tons of shows with his company Groove Therapy which turned into a well known electronic label in 2014. Whether its Drum & Bass or just straight Bass bangers there is no mistaking who's on stage when Dali steps to the decks. So bring your best dancing shoes and remember the best therapy is finding your groove on a dance floor.